↑ Shakhashiri, B. Z. (17 March 2008). "Chemical of the Week: Aluminum". SciFun.org. University of Wisconsin. 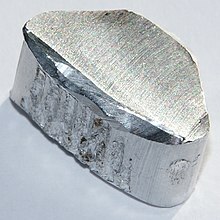 http://scifun.chem.wisc.edu/chemweek/PDF/Aluminum.pdf। আহৰণ কৰা হৈছে: 4 March 2012.